After a quiet third day, the Indian contingent announced themselves once again on the fourth day by garnering a string of medals. From politicians to actors and from journalists to retired sportspersons, everybody has come together to congratulate the medal winners at Commonwealth Games 2018. Indian sportspersons kickstarted the 21st edition of Commonwealth Games with a bang, thanks to Saikhom Mirabai Chanu and Sanjita Chanu for clinching the gold medals in the early two days of the sporting extravaganza. After a quiet third day, the Indian contingent announced themselves once again on the fourth day by garnering a string of medals. Weightlifter Punam Yadav and 16-year-old shooter Manu Bhaker were the highlights of the day as they secured gold medals in their respective games. Heena Sidhu managed a silver medal in shooting while Ravi Kumar and Vikas Thakur had to settle for bronze medals in 10m air rifle and 94 kg weightlifting respectively. The prominent Indian personalities from all walks of life have been singing praises of the Indian participants who are in Gold Coast, Australia and sharing a flurry of morale-boosting posts on social media platform Twitter. From politicians to actors and from journalists to retired sportspersons, everybody has come together to congratulate the medal winners at Commonwealth Games 2018. Many Congratulations to Ravi Kumar for shooting a bronze in the 10 m air rifle shooting event at #CWG2018. 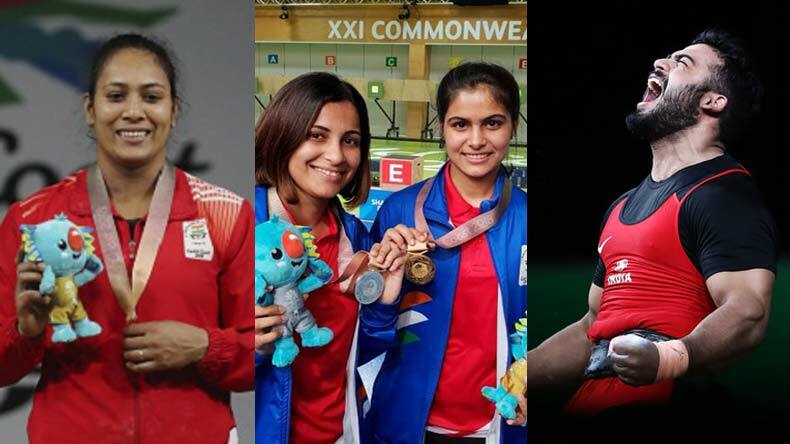 Congratulations to #ManuBhaker for winning a gold medal and to Heena Sidhu for winning a silver medal in the women’s 10m air pistol event at the #CWG2018! The Daughters are making the nation proud! Strength & growth come only through continuous effort and struggle! Kudos to #VenkatRahulRagala for all his effort and my heartiest congratulations 💐 to him for winning another gold medal🥇for #India in #CWG2018. It’s a #ProudMoment for all of us!